Earthquakes: Nucleation, Triggering, Rupture, and Relationships to Aseismic Processes; Cargèse, Corsica, France, 2–6 October 2017. 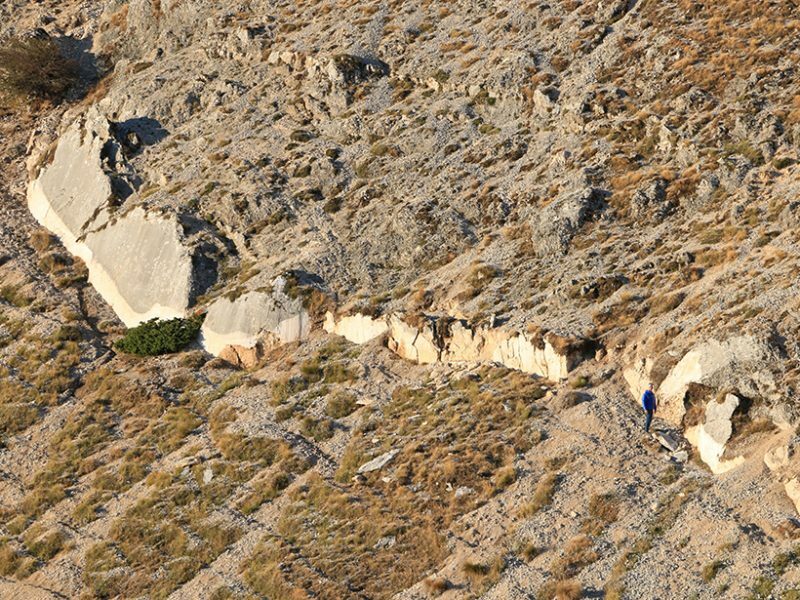 This fault scarp in Italy’s Apennine Mountains, an example of surface-rupturing normal faulting, formed during the complex 2016 Amatrice-Norcia earthquake sequence. Attendees at a school in Cargèse, on the French island of Corsica, discussed current topics of interest in earthquake behavior and new developments in understanding complex earthquake sequences. Photo Credit: Maxime Godano. The second Cargèse school on earthquakes, held last October, covered important and persistently challenging topics in earthquake behavior, including what factors control earthquake nucleation, how static or dynamic stresses and fluid injection trigger earthquakes, and how recent progress in measuring aseismic deformation might inform our understanding. The 79 participants representing 21 nationalities, mostly Ph.D. students and postdocs, and the 20 lecturers addressed these questions from a range of disciplines and over a range of spatial and temporal scales. Throughout this school, a recurring topic of discussion was what new insights have been gained since the first school in 2014. Here are some of the new developments presented at the 2017 school. Presentations on new observations of the complexity of earthquake rupture—perhaps most notably in the 2016 Kaikoura, New Zealand, earthquake—emphasized the critical role that geometric complexity must play in earthquake physics. With some notable exceptions, earthquake scientists have confronted this complexity only intermittently in the past. However, recent developments in sensor technology, such as nodal-style seismic instruments, remote sensing using interferometric synthetic aperture radar (InSAR), and high-performance computing, increasingly allow scientists to discern complexity and explore its role in earthquake behavior. Another new development presented at the school arises from multiple studies of large subduction zone earthquakes. These studies point to a preparation phase that manifests as foreshocks and possibly slow slip before some large events, sometimes originating at relatively shallow depths where the fault friction is thought to be high. The question of whether this preparation phase is the manifestation of a cascading failure process or is driven by an underlying aseismic process of unknown origin remains at issue. Another important contributor to progress, discussed at the school, is the continuing development and application of new signal processing approaches to discern small earthquakes and weak deformation transients. This development is especially significant because the mechanical processes at work in weak deformation transients are poorly known. Laboratory exploration of established and proposed friction laws, of the slip rate–dependent and slip-dependent types, will be essential to elucidate those processes. Lab experiments and numerical simulations are making steady progress toward more realistic physical models that account for such factors as fluids, roughness, and damage zones. These models also provide new insight into earthquake processes. Induced seismicity, which was also discussed at the school, provides an opportunity to accelerate progress in understanding the role of fluids in faulting. It also fills the spatial gap between laboratory experiments and naturally occurring tectonic earthquakes. Greater access to data relevant to induced seismicity would help realize its potential for furthering earthquake science in general. At the end of the school, there were rumblings about the next one. What important current trends might we anticipate? 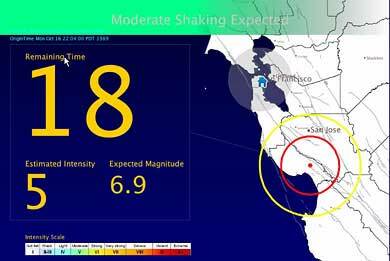 Machine learning and data mining applied to earthquake science are emerging as an important area. Other examples include continued new insights from studies of induced seismicity and potentially even a controlled earthquake experiment. Finally, new observational capabilities—the ramping up of InSAR satellites, lidar surveys, dense seismometer arrays, and novel and highly ambitious deployments like S-net, which spans the seafloor from the Japanese coast to beyond the Japan Trench—are certain to provide new insights and will help ensure that future earthquakes teach us more than has been possible previously. More information about the school can be found on its website. David Marsan, ISTerre, Université Savoie Mont Blanc, Le Bourget du Lac, France; Greg Beroza (email: beroza@stanford.edu), Department of Geophysics, Stanford University, Calif.; and Joan Gomberg, U.S. Geological Survey, Seattle, Wash.